For the longest time, all my scrapbooking stuff was in a small tote that I had to pull out of the closet when I wanted to scrapbook. I had accumulated so much, that my tote started filling up and I had to start keeping things on top of my tote. Well, last weekend my hubby and I were at Michaels looking around and he saw these two scrapbook organizers. After looking at them for a while, I was convinced that they were perfect for me! Also, to make things even better, they were half off! I love good deals! Now I don't have to break my back carrying out my tote every time I want to scrap. 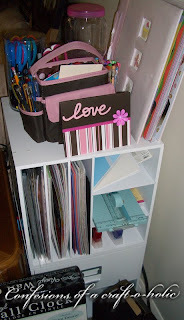 Here is a great website for more ways to organize all your scrapbooking items. 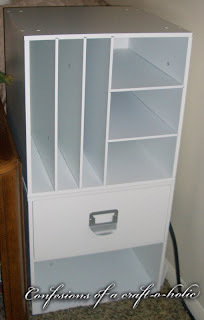 I have always wanted a big scrapbook organizing shelf like that! It looks awesome! Also I love the store pebbles in my pocket, and wish we had something like it out here! At least we have a Michaels and a Hobby Lobby though.